PLC M8000-M8990 is a special internal relay of Mitsubishi PLC. M8000 is a special auxiliary relay. m8000 is always closed during operation. m8001 and m8002 are initialization pulses. When plc is just started, it closes a cycle, but 8001 is normally closed, 8002 is normally open, m8011, 8012, 8013. It is a time pulse with periods of 10ms, 100ms, 1000ms (one second), m8020, m8021, m8022, which are standard real bits, representing benefits, zeros, and endings. There are other special auxiliary relays, which are commonly used. If you want to know more, you need a programming manual. M8000-Operation monitors normally open contacts, and the PLC is always ON when it is running. M8001-Operation monitors normally closed contacts, and the PLC keeps OFF when it is running. 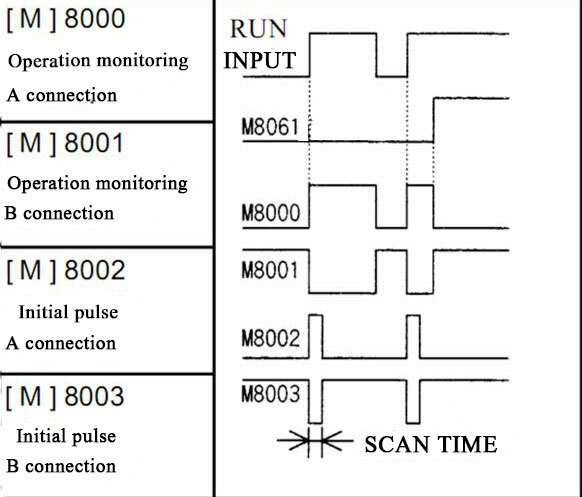 M8002 – Initialize pulse normally open contact, ON one scan cycle when PLC is running. M8003 – Initialize pulse normally closed contact, OFF one scan cycle when PLC is running. M8011, M8012, M8013, and M8014 generate clock pulses of 10ms, 100ms, 1s, and 1min, respectively. (2) Coil type. The PLC performs a specific action after the coil is driven by the user program. M8033 – If its coil is energized, the output image memory and data register contents are maintained when the PLC is stopped. M8034 – If the coil is energized, the output of the PLC is completely disabled. M8039 – If its coil is energized, the PLC will operate according to the scan time specified in D8039. M8000– runs normal open contacts and PLC runs ON all the time. M8001– runs normal closed contacts and PLC runs OFF all the time. M8002– initializes the pulse normally open contact. PLC runs ON with a scan cycle. M8003– initializes pulse normally closed contacts. PLC runs OFF with a scan cycle. This entry was posted in plc program and tagged m8000 mitsubishi plc, m8001 mitsubishi, m8002 mitsubishi, m8013 mitsubishi, mitsubishi plc special relays on September 26, 2018 by arco. M8002 is a Mitsubishi start-up pulse relay, which starts when the Mitsubishi PLC starts up and generates a pulse which can be used to initialize some parameters. As soon as you start on a pulse, M8002 is taken to rise, along the three lines are: a power + 24 or other voltage, a ground line com 0V…, one is a signal line, you first turn on the 24V signal line and the ground line between, you see if there is any voltage. Photoelectric switch as long as your wire pair, in the output line with a multimeter to detect voltage, often open is to detect the object when there is output, often closed is to detect the object when there is no output. PLC as long as there is no trouble in itself, the M0 will be set up when the power is switched on. But it will happen only when the power is cut off or the stop button is activated again. Because M8002 is the boot pulse. This entry was posted in plc program and tagged m8002 mitsubishi on August 22, 2018 by arco. What is m8002 in PLC? 1, M8002 is used for initialization of PLC. PLC will execute once after every power failure and restart, M8002. 2: Name: initial pulse normally open contact. ON outputs a scan cycle of RUN. 3, you need to do data initialization when using, usually do initialization time. This entry was posted in plc program and tagged m8000 mitsubishi plc, m8002 mitsubishi, mitsubishi plc special relays, plc basics on October 11, 2017 by arco.